In our society today, vaccinations are promoted by many doctors and chosen by many parents for their kids. Although created to do good, there are also undesirable side effects that can occur due to a vaccination. A plethora of different studies and stories show that harmful results may come from certain vaccinations. The Institute of Medicine Committee found that the current vaccinations recommended have not been fully tested for safety2. There are still some questions when it comes to this topic. Some symptoms that can occur after receiving a vaccination include swelling or redness at the injection site, hives or rashes, a state of shock, crying, fever, muscle weakness, fatigue, and paralysis2. Aside from basic physical and emotional side effects like these, the shots are said to be linked to other more serious diseases and disorders as well. Asthma, ADD, Tourette’s Syndrome, epilepsy, and autism are all said to be possibly correlated with vaccinations2. A specific vaccination concerned parents think about is the MMR. Short for “measles, mumps, and rubella”, this vaccination was created to protect children against those specific diseases. The CDC recommends that children receive this vaccine in two doses between the ages of 12 months and 12 years3. With rises in reported ASD’s (autism spectrum disorders) since more kids have been receiving MMR, parents are starting to see a correlation between the disorder and the treatment1. Every vaccine given and trusted by doctors also comes with a risk, like anything. This risk can range from a slight soreness to even death, in some cases. The CDC already advises that pregnant women not get MMR, for it can harm the baby4 – this itself should be an alarm that this vaccination and more might not be the right option for you and your children. 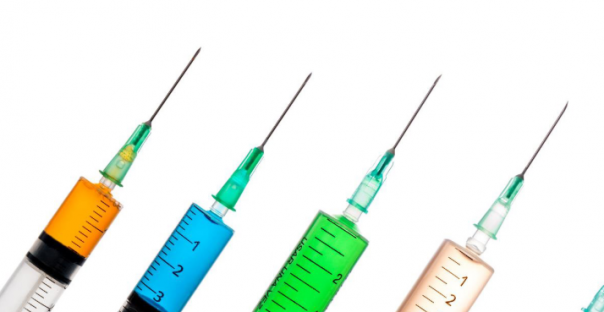 Before deciding to inject your children, be wary of the risks you’re taking. You might be saving them from a deadly disease – yet, you might be exposing them to one instead. Would you ever guess that the source of your chronic headaches could start in the jaw? As it turns out, your chiropractor and your dentist might have more in common than you would think. Temporomandibular joint disorder (TMJ) describes a condition in which one or both of the hinges connecting the mandible to the skull (or the upper and lower jaw) suffers acute or chronic inflammation and fails to work properly. This hinge allows the jaw to move forward, backward, and side-to-side, and is one of the most complex joints in the human body. A misalignment between the upper and lower jaw can feel as though your jaw is “stuck” momentarily, and is often accompanied by popping or clicking sounds. Symptoms associated with this disorder include tenderness or soreness in the jaw, neck, and upper back muscles; pain induced by yawning, opening the mouth widely, or chewing; clicking or popping sounds when the mouth is opened or closed; and headaches, earaches, or pain behind the eyes. The primary cause of TMJ remains unknown, but bruxism (teeth grinding), trauma, and degenerative joint diseases normally aggravate these symptoms. In short, temporomandibular joint disorder is all too common. While there is no definitive cure for TMJ, leading dental experts recommend a few popular approaches to treatment: medication (muscle relaxers, aspirin, or over-the-counter anti-inflammatory drugs), night guards (to reduce the effects of tooth clenching and grinding), relaxation (developing techniques to reduce the tension in your jaw), and finally, corrective surgery if all else fails. 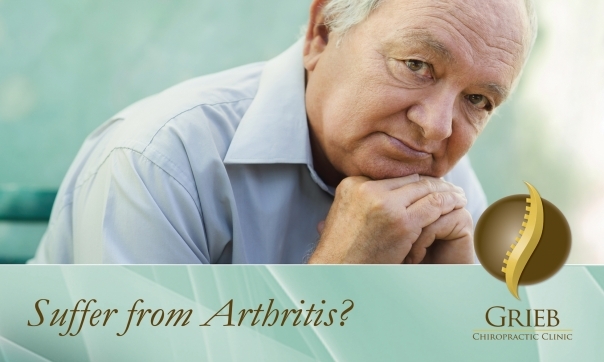 Like any other joint in the body, degenerative and arthritic effects may set in if this problem remains unaddressed. So where does chiropractic come into play? 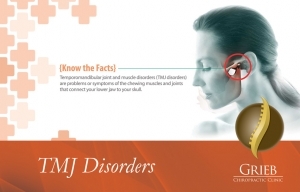 In its most basic form, TMJ characterizes the misfiring of a complex system of muscles, discs, ligaments, and bones. Sound familiar? Chiropractic medicine is designed to correct precisely these issues, regardless of where they occur in the body. It relaxes the muscles, adjusts the joints, and utilizes specific trigger points to properly re-position the body. At Grieb Chiropractic Clinic, we offer a free spinal analysis to correct the symptoms of TMJ and realign both your jaw and spine to achieve full body wellness. Here’s how chiropractic can help. At your free spinal analysis, you will undergo a series of x-rays to determine whether your symptoms are indeed the result of TMJ or a misalignment of your cervical spine. If you do suffer from TMJ, this treatment will relieve tight muscles in your back and spine and reduce the amount of stress placed on the jaw. More specifically, we will use active release techniques around the afflicted area to specially care for this condition. First, active release treatment involves gently massaging the muscles surrounding the jaw on both sides. Then, the joint is adjusted using hand and instrument contact that is specific to the jaw. Not only can this approach ease the negative side effects of TMJ, but also greatly increase range of motion while opening and closing the mouth. This disorder could potentially relapse if ignored, so make sure you continue to visit our office and receive the full benefits of chiropractic care. Realign your spine and nervous system, and stop suffering needlessly from TMJ. Give us a call to set up an appointment at (724)-935-6050 today! “Text neck” refers to pain and neck damage sustained by looking down at your cell phone, tablet, or wireless device too frequently and for too long. The symptoms associated with “text neck” (in addition to neck pain and soreness) are sharp, nagging upper back pain and muscle spasms, shoulder pain and tightness, and pain radiating down into the arms and hands from a pinched cervical nerve. If left untreated, these symptoms may lead to chronic problems. “Text neck” is known to cause the early onset of arthritis in the neck in addition to the alteration of the natural spinal curve, resulting in permanent muscular and spinal deformation. Teenagers and children are especially prone to these effects during their developmental stages, but this phenomenon is equally concerning for adults. According to a recent study conducted by the International Data Corporation (IDC), “79% of the population between the ages of 18 and 44 have their cell phones with them almost all of the time – with only 2 hours of their waking day spent without their cell phone on hand.” We depend on the modern conveniences afforded by technology every day. As a result, we need to be aware of the unfortunate side effects that arise from its overuse, and know how to address the warning signs of a permanent health issue. At Grieb Chiropractic, we offer a free spinal analysis that will allow us to assess any pain or discomfort in your neck and upper back, and begin a treatment plan to restore full mobility in those areas affected by “text neck.” Here’s how chiropractic can help. During your free spinal analysis, we will most likely recommend an adjustment to gently correct the position of your spine. This spinal manipulation will properly align the vertebrae in your neck and upper back, and alleviate the danger of a pinched nerve or herniated disc. Specific hand contact, massaging, and stretching will begin to ease muscle strain and discomfort, and EMS technology will further reduce the irritated and inflamed areas. With repeated visits and dedication to spinal health, we will ensure your immediate comfort as well as your future wellbeing. While chiropractic care provides vital steps toward recovery from “text neck” symptoms, there are simple habits you can practice at home to reduce the likelihood of future strain. Ultimately, you want to avoid bending your head forward for extended periods of time. While looking at a handheld device, make sure that the screen is kept at eye level. If you work at an office, position your computer in a way that aligns your head squarely with your shoulders and spine as you look forward. Finally, you should take frequent breaks throughout the day to look up from your device and remove the excess weight to avoid neck pain. 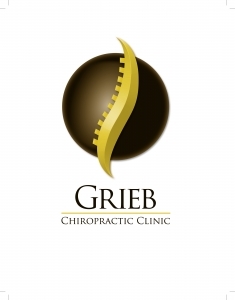 Gentle treatments provided by Grieb Chiropractic, combined with careful attention to posture and technology usage at home, will spare you and your family of injuries caused by “text neck.” Give us a call to set up an appointment at (724)-935-6050 today! You wouldn’t leave your kids out of your plans to visit the family physician for a checkup, would you? What makes the family chiropractor any different? Chiropractic treatment presents unique benefits to people of all ages, but can be especially valuable to children as a form of preventative care. Children are constantly growing and changing in their early stages of life, which makes them particularly vulnerable to spinal misalignment. Chiropractic care for children is important because a minor misalignment may not result in immediate pain or discomfort, but could require the same attention and care as an injury to prevent spinal nerve stress. Spinal nerve stress results from any misalignment of the spine, hips, or cranium (also known as a “subluxation,” or a pinched nerve) that irritates the surrounding nerves and impairs the function of the nervous system. As the nervous system regulates and controls all systems of the body (circulatory, respiratory, digestive, hormonal, eliminative, and immune) a subluxation could debilitate any aspect of your child’s health. The risk of spinal misalignment begins as early as birth. Even the most natural birthing process places stress on an infant’s spine and nervous system, which could result in common complications like colic, breathing problems, sleep disturbances, and nursing difficulties. As your child ages, even every day activities like bike riding may cause subluxations. If spinal nerve stress is not properly addressed and treated during this time, it can leave lasting effects on the health and performance of an adult spine. Chiropractic care does aim to treat disease, but rather restore the body to normal function and allow it to properly regulate and heal itself. By gently adjusting the spine to correct alignment, this natural form of treatment relieves interference of the nervous system and allows each of the body’s systems to work at full efficiency. Ear infections are one of the most common afflictions that affect young children, and one that responds well to a conservative approach to treatment. Ear infections occur when too much fluid or pressure builds up in the ear canal, and can result in painful soreness, popping or ringing in the ear, difficulty hearing, or fever. These symptoms are often treated with antibiotics or the surgical implementation of ear tubes. However, this type of approach leaves the child vulnerable to the adverse effects of surgery, or at risk of contracting another infection after developing a resistance to the antibiotic. At Grieb Chiropractic, we offer a free spinal analysis in a family-friendly atmosphere that will allow us to identify any subluxations in your child’s spine, and restore his or her body’s systems to full efficiency without the use of antibiotics. Here’s how chiropractic can help. Spinal manipulation, combined with specific hand contact and gentle stretching, will alleviate the subluxation and position the vertebrae back into correct alignment. These procedures are customized to fit a growing child’s unique height, weight, and spinal condition, and are applied gently to avoid discomfort. With the spine in proper position, particularly the vertebrae located in the upper neck, the excess amount of fluid in an infected ear will be able to drain more easily through the Eustachian tube and remedy the current affliction, as well as prevent future infection by keeping this pathway open and clear. As previously stated, chiropractic care does not in itself cure disease. Instead, it acts as a restorative and preventative measure that enables the body to work efficiently and heal ailments without antibiotics or invasive procedures. 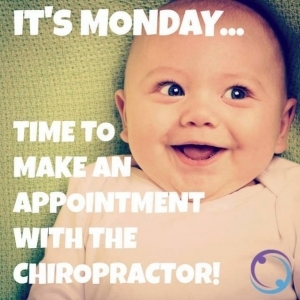 While chiropractic is often only considered after a serious injury or the presence of back pain, it should be a regular part of your child’s routine to ensure a future of full body health and well being. Try chiropractic first. 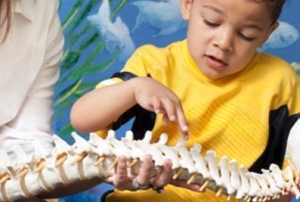 Chiropractic care for children is a call away. Call 724-935-6050 today! Are you afflicted by an unknown source of shooting pain, tingling, or numbness down the arms or legs? How about pain radiating down your body as far as the calf muscle, or even the foot? If you unfortunately find yourself nodding “yes” in response to either of these questions, you might be suffering from a herniated disc. The leading cause of lower back and leg pain (sciatica), herniated discs occur most often in the lumbar region of the lower spine, but can also appear in the upper neck and shoulder regions. In order to recognize the presence of a herniated disc, and understand why this injury can be debilitating if not properly treated, it is helpful to be familiar with the basic anatomy of the spine. The spine consists of individual bones (vertebrae) stacked on top of one another and separated by circular pads, or inter-vertebral discs. These discs give the spine its ability to bend and twist, in addition to providing critical protection in the form of shock absorption. Inter-vertebral discs consist of two main components: the inner, jelly-like substance known as the Nucleus Pulposis, and the outer ring of ligaments that surround this substance called the Annulus Fibrosis. This ring of annulus fibers keeps the jelly-like nucleus in the center of the inter-vertebral disc when gravity compresses an upright spine under normal conditions. However, if the fibers of the Annulus Fibrosis become weakened or strained, the Nucleus Pulposis can become inflamed, bulge (herniate), or even rupture outside of the vertebrae and into the spinal canal. Developing a herniated disc grows more likely with age, but it can also be the result of twisting or lifting a heavy object. The symptoms of this injury vary from case to case, but can include tingling, aching, or burning sensations in the afflicted area, pain or numbness extending to the arms and legs, muscle weakness, or pain that worsens after sitting, standing, or walking short distances. The presence of leg pain stems from the added pressure that the herniated disc places on the spinal nerves as they run through the spinal canal. If left untreated, a herniated disc can leave permanent nerve damage, and cause a loss of sensation or muscular strength in the back of the legs and inner thighs. Before a taking a surgical approach to this problem, we recommend the conservative treatment provided by chiropractic care. At Grieb Chiropractic Clinic, we offer a free spinal analysis that will allow us identify the presence of a herniated disc, and determine the proper course of therapy that will heal the injury without the use of invasive procedures. Here’s how chiropractic can help. 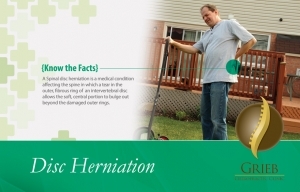 The most effective chiropractic treatment for a herniated disc is the use of the Cox Technique, or spinal flexion distraction. This technique utilizes a specially designed table to administer stretches that gently lengthen and decompress the spine. During treatment, the patient lies face down and the lower half of the table supporting the legs remains mobile. The doctor then guides this section down and away while applying specially targeted hand contact to stabilize the vertebrae above the affected disc. This series of stretches is applied with a push-pull movement in a way that is rhythmical, slow, and smooth, and ultimately intended to reduce the amount of pressure on the damaged inter vertebral disc. This decrease in pressure not only reduces pain in the surrounding area, but also aids in the healing of the strained outer ring of the damaged inter-vertebral disc. The movements create a “vacuum effect” on its inner nucleus (known as disc decompression) drawing the substance back into the center of the disc and reducing the size of or completely resorbing the herniation. This decreases the pressure that was placed on the spinal nerves by the bulging disc, and stops pain, tingling, and numbness from radiating into the legs. The spinal flexion distraction treatments provided at Grieb Chiropractic, combined with electrical stimulation and physiological therapeutics from repeated visits, will ease your immediate discomfort and begin preventative care for your future well being. Try chiropractic first. Give us a call to set up an appointment at (724)-935-6050 today! Whiplash — Hurt in an Accident? As summertime comes into full swing, thoughts of beach vacations, relaxing by the pool, and time spent with family are first on everyone’s mind. 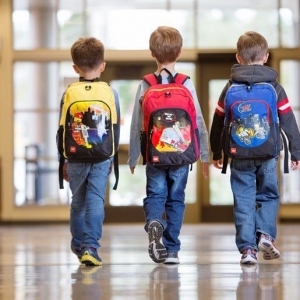 While summer vacation has always been a cherished pastime for kids (and adults) alike, it also brings an invisible danger that people often fail to consider. 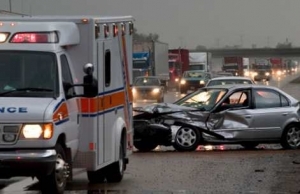 According to the Insurance Institute for Highway Safety (IIHS), the summer months prove more dangerous than those in winter for car safety and frequency of auto accidents. July, August, and September have consistently held the highest rates of car accidents compared to any other months during the year. Several factors contribute to this spike in auto accidents over the summer, such as a greater number of teenage drivers on the road, drivers on vacation who are travelling and therefore unfamiliar with the area, an increase in construction and maintenance work, and tire blowouts due to overheating which can result in whiplash. If you or someone you know falls victim to this trend, the best course of action involves more than just repairing a damaged vehicle. Whiplash, the most common injury resulting from a car accident, can go weeks without detection and have permanent effects on your health and well being if left untreated. “Whiplash” refers to an injury of the neck/upper back caused by a sudden, forceful movement of the head, either back-and-forth or sideways. It is characterized by an extremely rapid extension and flexion of the neck, such as the type of movement you would experience if you were involved in a fender bender. This movement can damage the supporting muscles, connective tissues, and ligaments in the surrounding areas of the injury. The effects of this injury can appear as a variety of symptoms, such as neck pain, headaches, fatigue, and upper back, shoulder, or lower back pain. As previously mentioned, these effects are often delayed and can take weeks, or even months, to fully develop. Even if you do not experience severe pain immediately after a minor accident, you may have sustained a whiplash injury. At Grieb Chiropractic Clinic, we offer a free spinal analysis to evaluate and treat whiplash symptoms, and can start you on the road to recovery back to the full enjoyment of your summer. Here’s how chiropractic can help. During an initial spinal analysis, you will receive an evaluation of your spine as a whole, not just the afflicted area. This allows us to identify any other regions of the spine that may have been affected, and check for restricted joint motion, intervertebral disc injury, muscle spasm, and ligament injury. The primary form of chiropractic treatment for these symptoms involves spinal manipulation and adjustment, which reduces inflammation of the nervous system and realigns the spine to its correct position to prevent future injuries. This treatment can be supplemented with electrical muscle stimulation (EMS) technology to further reduce painful irritation. In addition, gentle stretching and massaging of the injured area increases its range of motion, targeting the trigger points that relieve pain in these tightened muscles. After the initial phase of treatment, continued visits to our office will ensure your full recovery and future well being. The combination of these treatments, along with rest and recurrent visits, will work to restore your full range of motion and begin a lifelong habit of spinal care and attention. 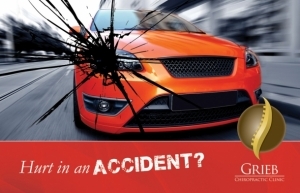 In addition to a free spinal analysis, Grieb Chiropractic Clinic offers 100% reimbursement toward the treatment of injuries sustained in auto accidents, meaning you will pay nothing out of pocket to ensure your long-term health and comfort. At our office, we can help you and your loved ones recover from life’s unexpected accidents and get back to enjoying time spent together this summer. Give us a call to set up an appointment at (724)-935-6050 today! Among people seeking Back Pain relief alternatives, most choose chiropractic treatment. Approximately 22 million Americans visit chiropractors annually. Of these, 7.7 million, are seeking relief from Back Pain from various causes, including accidents, sporting events, and muscle strains. Other complaints include pain in the neck, arms, and legs, and headaches. Chiropractors like myself use hands-on spinal manipulation and other alternative treatments to properly alignment of the body’s musculoskeletal structure, particularly the spine. This will help the body to heal itself functioning at your peak capacity. Manipulation is used to restore mobility to joints restricted by tissue injury caused by a traumatic event, such as falling, or repetitive stress, such as sitting without proper back support. The Grieb Chiropractic Clinic Wexford and Conneaut Lake locations techniques and protocols utilize a gentle approach of Chiropractic treatment in conjunction with stretching and strengthening exercises to provide pain relief and achieve your personal goals of health. Come in to your Chiropractor in Wexford today to receive a free spinal analysis!